Add a new dimension of tone to your guitar arsenal with the Fender American Standard Stratocaster HSS Shawbucker solidbody electric guitar. Fender worked with famed pickup designer Tim Shaw to create a new humbucking pickup that embodies the tone, feel, response desired in a bridge pickup. The alder body, maple neck, rosewood fretboard, and modern hardware combine to give you a smooth playing experience. You’ll also love the classic Fender touches and fan-favorites like hand-rolled fingerboard edges, staggered tuning machines, and aged knobs on the Fender American Standard Stratocaster HSS Shawbucker guitar. Aiming for pure and powerful HSS sound, Fender turned to humbucking pickup expert Tim Shaw to develop a truly spectacular humbucking bridge pickup, which they’ve showcased in this American Standard Stratocaster HSS Shawbucker Shawbucker guitar along with a pair of Custom Shop Fat ’50s single-coil pickups. Suffice it to say, he blew everybody’s expectations out of the water, drawing on years of work alongside some of the pioneers and masters of humbucker development to create an extremely modern style of pickup. Unique elements such as a dual 250k/500k volume pot lets you get the most out of each pickup, blending 500k brilliance with 250k sparkle. If you’re already a fan of the HSS Strat, then you need to check out this amazing axe. The Fender American Standard Stratocaster HSS Shawbucker gives you serious sustain, courtesy of its all-metal, copper-infused high mass bridge block with bent steel saddles with elongated string slots. The result is a two-point floating vibrato bridge/tailpiece that serves up sustain like a hardtail. If you love your whammy, but aren’t too fond of wimpy sustain, you’re going to love the Fender American Standard Stratocaster HSS Shawbucker. An undercoat serves to give the paint a smooth surface to adhere to so you have a nice looking finish. The thicker the undercoat, the more glass-like the finish, but the more constricted the guitar’s body wood, which could affect tone. Fender has switched to a new undercoat that is thinner, and that allows the body to flex and resonate more, while retaining the cosmetic advantages of an undercoat. The result? You get the tough-as-nails resilience of a modern poly finish, with tonal characteristics that are more in line with classic laquer finishes. 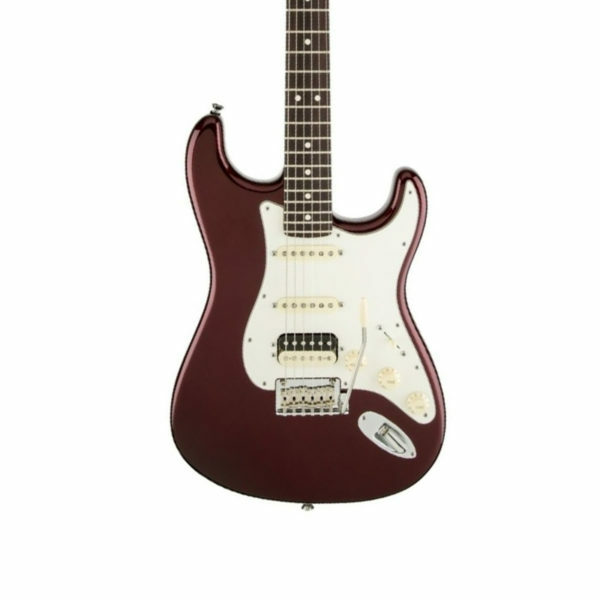 With Fender’s American Standard Stratocaster HSS Shawbucker, you get the best of both worlds.